High risk storage location (next to water valve). Photo courtesy of the Art Conservation Center @ Univ. of Denver (formerly RMCC), Denver, CO. The overall storage environment is one of the most important variables in the long term preservation and conservation of objects and associated records. It encompasses both the physical area(s) where collections are kept, as well as the physical safety of the items. In general, the storage environment involves the spatial layout of the storage area(s), controls over the environment, and disaster planning. Oversight of the storage environment is oriented towards mitigating the risks to collections, including: physical forces (e.g., flood, earthquake, tornado), fire, water, theft, pests, pollutants, light and radiation, incorrect temperature, incorrect relative humidity (RH), health of staff, and custodial neglect. Policies and procedures, such as a detailed risk management plan, should be in place to address controlling and minimizing these risks. Their negative effects can also be minimized through proper training, decreasing handling of objects and records, controlling access, and maintaining housekeeping procedures. The specific layout of a storage area depends on the types and number of materials in individual collections and in the repository overall. In general, the layout should minimize risks, while maximizing accessibility for repository staff. The choice of what storage equipment to use is often complex. Some equipment that is safe for objects may also be very expensive. Closed storage cabinets are usually preferable because they keep out dust, minimize exposure to air and light, and can be locked. When open shelving is used to reduce costs, objects should be kept covered. For associated records, it is best to store them in neutral pH folders within archival flip-top boxes on open shelves to minimize costs while maximizing access and good storage practices. 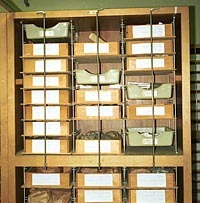 Long-term storage should be separated from other activity space, such as exhibition, research, object preparation, conservation, and administration. Such physical separation enhances security and protection for objects and records. It also enables the use of storage environments that are beneficial to the collections, but may not be ideal for humans to work in on a day-to-day basis (e.g., lower temperature and humidity, low light levels, etc.). Some repositories use off-site storage facilities. There are advantages to these in terms of activity segregation and use of space, but there can be drawbacks when it comes to access, security, and monitoring. Furthermore, environmental controls should be located in a repository to control the temperature, humidity, light levels, Ultraviolet (UV) rays, pests, and air pollution that may harm collections. Proper environmental controls are important for minimizing deterioration rates, extending object life, and decreasing conservation needs. While some controls need to be located amongst the collections, such as fire suppression systems and humidity monitoring, others need to be separated from the collections, such as the heating and cooling system, whenever possible. Environmental monitoring at the Anasazi Heritage Center. From the photograph collection of the Bureau of Land Management, Anasazi Heritage Center, Dolores, Colorado. Temperature and relative humidity (RH) are two of the most important aspects of the storage environment to control. Extreme levels and fluctuations of temperature and RH can be devastating to many materials, especially wood, leather, bone, paper, photographs, and electronic media. Temperature and humidity may be monitored through the use of a hygrothermograph or data logger. Acceptable ranges depend on the object or record material. In general, a good RH range is 40-60% (although this is too high for photographic materials) and a good temperature range is 68-72° F. It is always better to have a temperature and RH that are constant (within or slightly outside of the recommended range) than to have fluctuating levels. Consistent levels can be accomplished in a number of ways. One is to create buffering zones and microclimates for the objects or records themselves. An artifact in a polyethylene bag, placed in a box, and stored in a cabinet is not as affected by outside environmental fluctuations. Another common method for buffering RH is the use of silica gel, an inert material that is usually used to absorb excess humidity. It may also be conditioned to maintain a constant RH. Light and ultraviolet rays may be very damaging to many materials, especially textiles, paper, wood, and photographs. Light should be kept low in storage areas when work is taking place and off the rest of the time. Natural light should be avoided. Ultraviolet light (UV) should be filtered to block it out. Ideally, the storage area should contain no windows, lights should be turned off in areas not in use, and closed cabinets should be used when possible. Light levels may be monitored easily with a light meter. Levels should be kept between 50-300 lux, depending on the item, in exhibition spaces. The actual time an object or record spends in the light is also a factor in deterioration. A range of 96,000-576,000 total annual lux hours is the recommended range for most items (Read 1994). Snake skin and dirt in the bottom of a collapsed artifact box. Photo courtesy of Alexandria Archaeology, City of Alexandria, Virginia. Pests vary enormously from the smallest mite to the largest rodent. They can wreak major havoc on collections (as seen with our "mascot" -- a mouse that ate through a prehistoric basket in storage). Careful monitoring of pest activity in storage areas (and throughout the entire repository) is essential for the health of the collections. The most common approach to pest control in repositories today is called Integrated Pest Management (IPM). IPM is a systems approach that emphasizes prevention, use of the least toxic methods, and treatment of the building as one system. Prevention entails consistent monitoring and inspection for pests and pest problems. 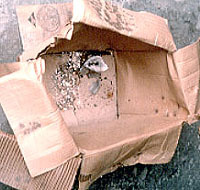 Preventive measures can include locating and eliminating pest attractors, using sticky traps, and locating and eliminating pest entrances. When pest problems do arise they can be combated through the use of low or non-toxic procedures such as vacuuming, traps, freezing, and oxygen deprivation that pose little or no harm to humans and the collections. When these methods are not enough, experts should be consulted about applying more toxic methods, such as fumigants and pesticides. There are a number of other materials that can put both the collections and the collections management staff at risk. Some of the principal ones are discussed here. All underscore the utility of an Integrated Pest Management program, as well as the need to perform periodic inventories, facilities inspections, and risk assessments in a repository. Microorganisms, such as mold and mildew, may grow on the surface of organic matter (e.g., wood objects, paper) and may irritate human lungs or lead to disease, especially in the presence of dampness or decay. They produce irregular stains that may seriously damage museum items, including paper, leather, wood, and cloth. Low relative humidity (ideally between 45-55%, but below 65%) and lower temperatures help to reduce microorganism growth. Only extreme cold or heat destroys them. A potentially more serious health risk to repository staff and others, as well as a contaminate of collections, is deteriorating asbestos. A popular building material used between 1940-1975, it can be found in the insulation, fireproofing and other components of a repository ceiling, walls, and floors, as well as in many other locations. Asbestos is activated when cut, crushed, scraped, or released from its binding materials in other ways. The tiny, abrasive fibers may then enter the human airways and lungs and lead to a variety of serious diseases. It is best not to work in pre-1975 areas with exposed insulation, damaged walls, ceilings, or floors, or where renovation or repair work is occurring. If work in asbestos contaminated areas cannot be avoided, protective clothing, gloves, and a respirator is essential. Hantavirus is one of several serious respiratory diseases transmitted primarily as airborne particles. Hantavirus is caused by dried saliva or feces of deer mice. These and other rodents can get into museum collections. Therefore, in high risk areas of the American west, it is advisable to quickly process and rehouse newly received archeological collections, perform regular housekeeping procedures, and carefully assess and inventory collections in newly acquired, remote facilities. Drawer storage system for archeological artifacts. Note system includes security bar to ensure drawers stay in place during seismic activity. From the photograph collection of the U.S. Army Corps of Engineers, St. Louis District. Another health risk to repository staff, researchers, culturally affiliated groups, and other users of museum collections are the toxic residues from pesticides once used on old collections to kill insects. The residues from arsenic compounds, mercury salts, and various other toxic fumigants may lie on museum objects for years until stirred up by human activity. At that time, the toxins may penetrate a person and cause serious health problems. Conservators and scientists are researching ways to detect contaminated items, to identify the source and quantity of contamination, and to handle removal. The archeological objects and associated records, including digital data, in a repository are irreplaceable. Security and protection from loss are therefore essential aspects of the storage environment. Big risks to the complete loss of individual items or whole collections are theft, natural disaster, and fire. Security against theft can be achieved through practical methods or advanced security systems. Relatively inexpensive ways to increase security involve restricting access to collections in storage, as well as to different areas of the repository. Thus, all access to and use of collections should take place in a supervised research room with sign in and sign out procedures in place. There should also be a system of controls over who can use particular keys to specific rooms on what occasions. Regular and systematized inventory of the collections also helps to detect theft. More expensive and detailed procedures may include the use of locked storage or exhibition containers, security personnel, and electronic intruder or theft detection systems. There are several possible natural disasters that could affect repository collections, especially flooding, earthquakes, and tornadoes. Repository managers need to evaluate the likelihood of any of these or other disasters in their geographical area. They should then create a disaster management plan that considers the site of the repository (e.g., it is in a flood plain), its physical layout and construction materials, and the nature of the collections it contains. Protection from fire is also critical. Appropriate fire detection and suppression systems should be in place. Detection systems may monitor heat, smoke, or flames. 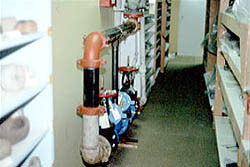 Many repositories use sprinkler systems (wet or dry) for fire suppression. The use of fire-resistant storage and exhibit containers can also minimize risk to objects, especially for highly flammable items such as textiles, paper, and wood. Fire protection for associated records involves a stable environment protected by a sprinkler system and a good smoke and fire alarm system. It may also include creating a security copy, a record duplicate for access and use. Associated records are generally not housed in fire resistant file cabinets for several reasons. 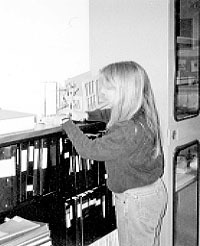 Due to their quantity, the weight could buckle most floors, the cost of the file cabinets would be prohibitive, and it would be very difficult to provide researcher access to records stored in cabinets as opposed to moveable boxes. Also, the fire-protective qualities of these cabinets may diminish over time. Policies and procedures for the prevention of fire are also important. These may include identifying, monitoring, and eliminating fire hazards; the segregation of flammable materials; and training staff on emergency procedures.